Me on first coasting test, no chain, no brakes. This past weekend I went to visit my son David and his family for a few days. They live in Plano, Tx. 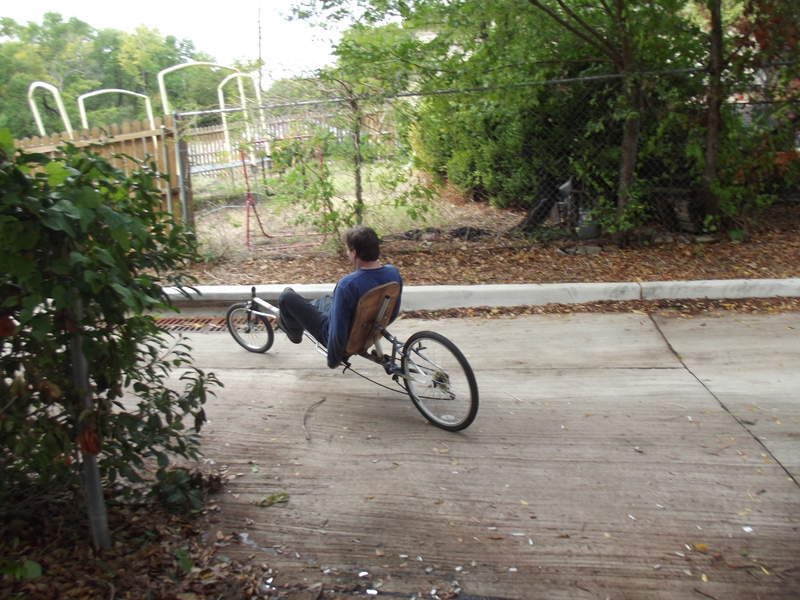 One of the reasons for the visit was to build a new seat for an old junk EZ-3 recumbent trike I had bought. The old EZ-3 needs a new brake system and some past owner had turned the 20/16 wheels into 26/20 which really messed up the gearing. To difficult for this old man to pedal. David said we could build a new bike from the Atomic Zombie plans I had purchased faster than we could fix the old EZ-3, and have a better bike. After estimating time (16 hours) and money ($100.00) I said OK. After 50 hours each and more than $100.00 and many, many trips to the hardware store we now have PoGo. 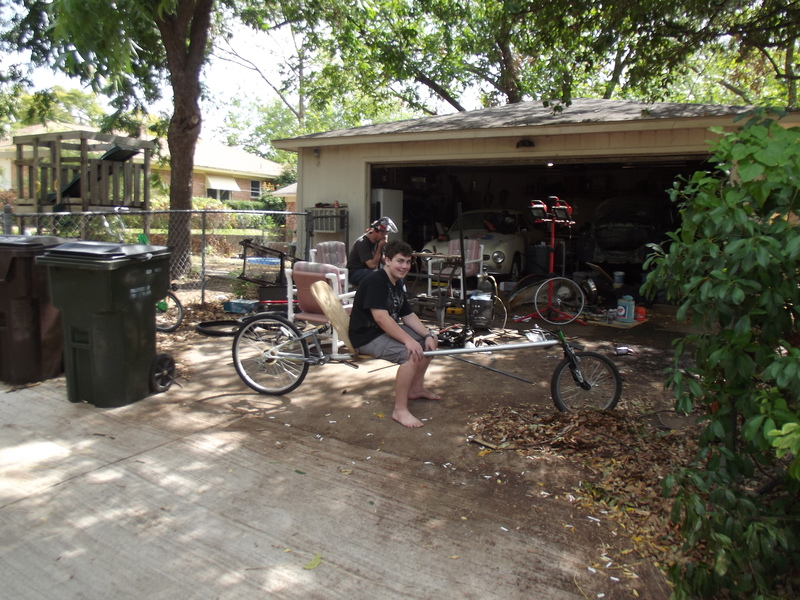 PoGo is what we nicknamed our first build of a homemade recumbent bike that has somewhat of a tendency to bounce up and down because of the rear suspension and the flex in the main tube. 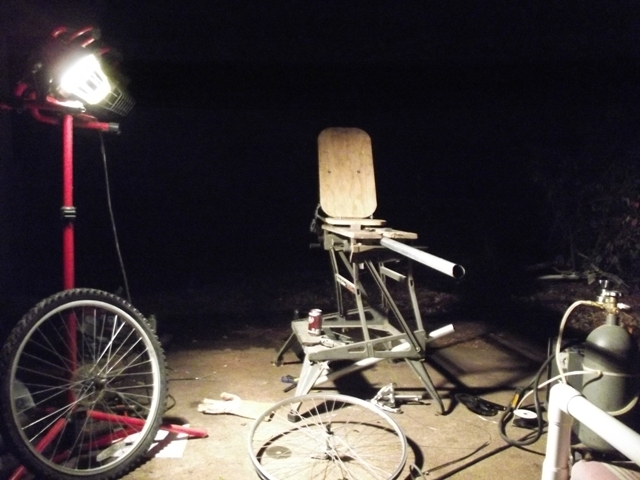 POGO was build from the plans for a recumbent called Voyageur from Atomic Zombie Extreme Machines. Everyone seems to like this pic. David grinding fishmouth in main tube. AZ plans are similar, gather up a few old 10 speed bikes, cut them up and use the parts to make a new unique bike. I’ve had a desire to make a few long distance bike trips and the Voyageur plans seemed to fit the general criteria of a bike that would be comfortable, fast and stable on the road. We’ll see. Tomorrow I start my first training session on PoGo. The EZ-3 recumbent was an easy ride, sit down on it and peddle. A two wheel version of a recumbent seems to be much different. The EZ-3 could go slow without a problem. Just go slow and sit there. Going up a hill, you could stop and rest and just sit there. PoGo does not like to go slow. If you go slow, it falls over and you just sit there. I guess I have a learning curve on PoGo. Learning how to make a recumbent go slow. Or do like when I was a kid and just go fast all the time. David leaving on first test run with chain. No brakes. My first coasting test ride ended with a crash. As I laid in the middle of the street with PoGo on top of one of my legs an old man passed on an upright watching and shaking his head. Some people just don’t understand the challenge of doing something you know nothing about. As he road passed me I said “anyone can do that”. He just road on shaking his head. My son, David worked very hard with me on this project and I cherish the time that I had with him and his family. This was a father, son and grandson project. My grandson, Calvin, up on two wheels. Here is a few pictures of PoGo. I’ll follow-up with more information about PoGo later with how we did it with mechanical and technical information and lots of pictures. 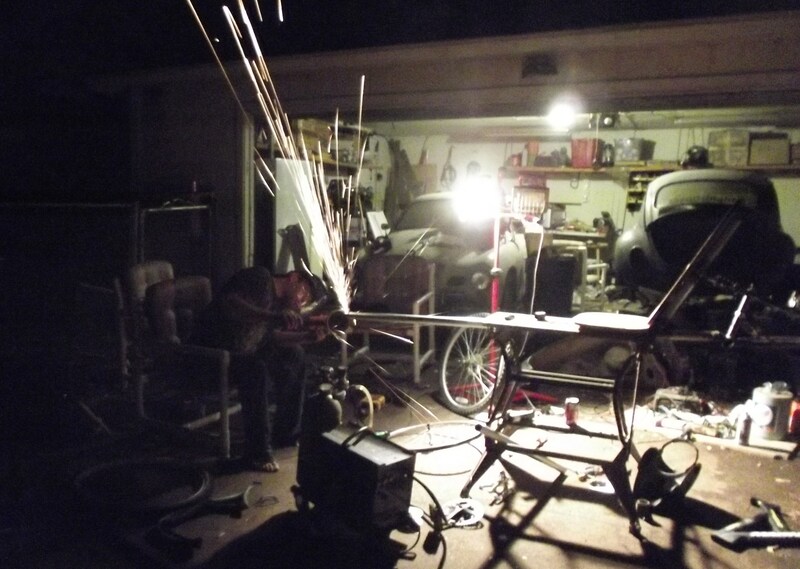 This is more of a picture account than a commentary of how we built the LWB recumbent. I still have many hours of work to do before I’m finished. Disassemble, sand, sand, bondo, sand, paint and reassemble. Some day it will be finished. This build was a joint effort between my son, grandson and myself. My son outworked me 3 to 1. We worked 12 hour days for 4 days and I missed my afternoon nap each day. 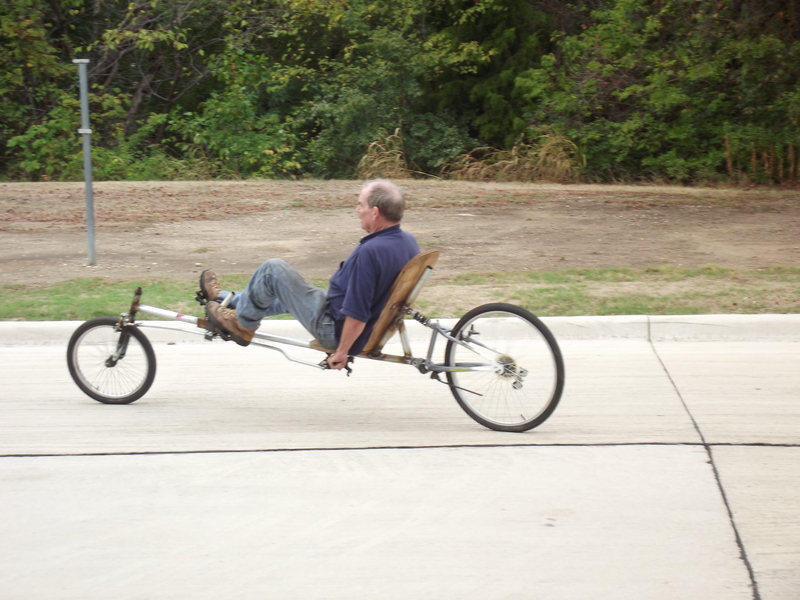 But in the end we had a ride-able recumbent ready for a few miles of testing before finishing. I brought it home to Edgewood, TX and plan on putting on the miles. recumbent. I had been riding an old EZ-3 that I had purchased and was making great progress toward getting back in shape. We borrowed some of the parts from the EZ-3 to complete PoGo so I’m waiting for a couple of donor bikes to put EZ-3 back together. Or not! I think I’ll cut the backend off of the EZ-3 and put a Tomahawk style SWB front on it. I thought I had a couple of donor bikes coming my way this week but it didn’t work out so I’ll just keep watching Craigslist and making offers. David nor I are welders so PoGo is rough in a few spots but improving as we go. I can’t weld with an electric welder because of a recent defibrillator implant so my future build will be brazed. One of our innovations was the steering assembly under the seat. We took a 7/8 inch bolt and welded it under the seat with a long nut. I think they are called coupling nuts. We then welded one of the steering control arms to the nut and screwed it onto the 7/8 inch bolt. There was a lot of welding surface on the head of the large bolt. There was plenty of room to adjust the height of the steering arm by turning the nut further on or off. This really worked quite well and saved a lot of labor. The rear suspension of the recumbent was from a mountain bike. We elected to leave the BB on the rear triangle with anticipation of putting in a jack shaft and another set of gears at a later time for some low-lows and some high-highs. Instead we put in a crankset and cut the crank arms off. 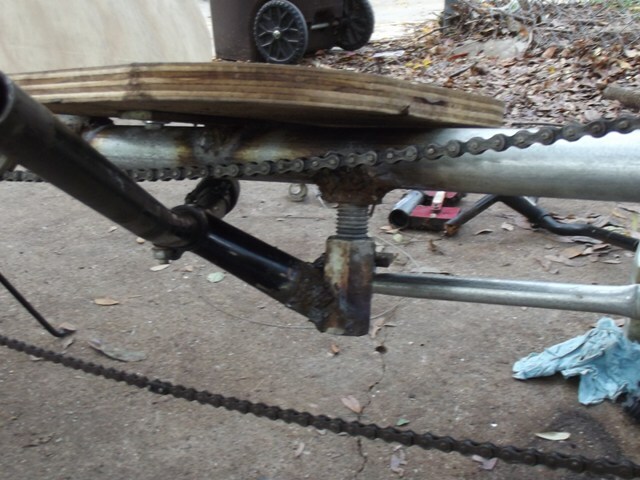 This was used for a chain guide along with a forward mounted pulley to guide the chain under the seat. Our first attempt at pulley guides was inline skate rollers. Although fabrication was easy they did not hold up well under pressure and the small 1/4 inch bolt bent. 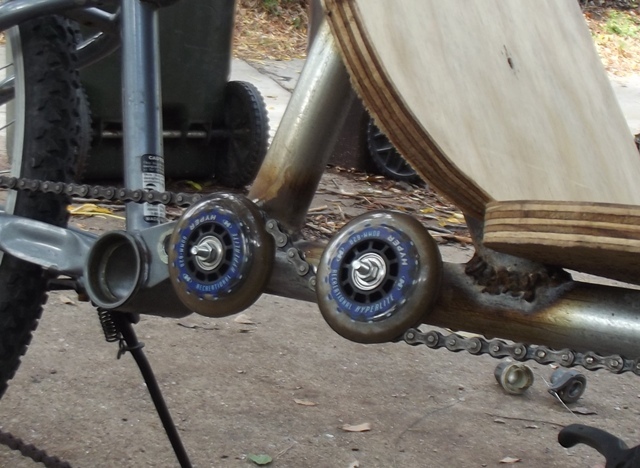 We later replaced the skate rollers with a pulley with bearing and used a 1/2 inch 8 grade bolt. 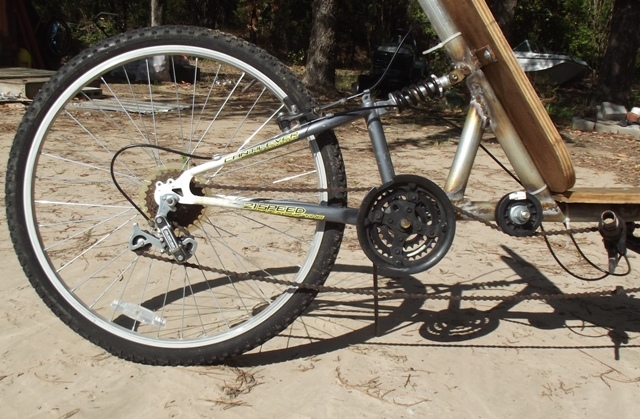 Head tube, front fork and brake are all 20″ from a BMX bike. Sometimes there are just not enough hands but this vintage Shopmate really proved it worth. I guess I’ll have to go buy another one, I think my son has had this one long enough to claim it as his. After a few rides I know I have to redo the handle bars and steering rod but I think that is about all. Also I think I will replace the wood/foam seat with fabric style seat to save a few pounds. This last picture I’m posting again just because I like it. This is a picture of my son grinding a fish mouth in the main tube at night. He really got the process down. And yes, several people have asked what are the cars in the background. I think I have the correct years. The one on the left is a 58 Karmann Ghia and the one on the right is a 65 VW bug. I can’t express enough how I enjoyed being with my son and his family for a few days. Like the MasterCard commercial, Recumbent bike $100, time with my son, priceless. 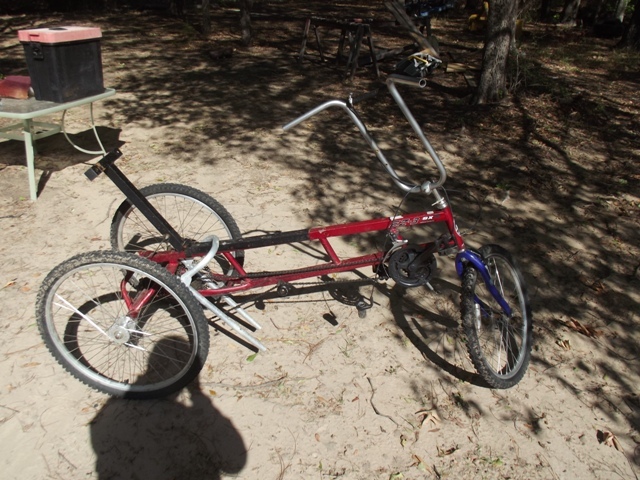 This recumbent has been decommissioned for several reasons and the parts made available for other projects. This bike requires a strong rider. Where I live, there are many hills and found I was not strong enough to climb hills on this bike. When dissembled, we found that the main tube has also had quite a bend in it. I weigh about 190 and my son about 210 and the EMT tube just did not hold up to the weight.